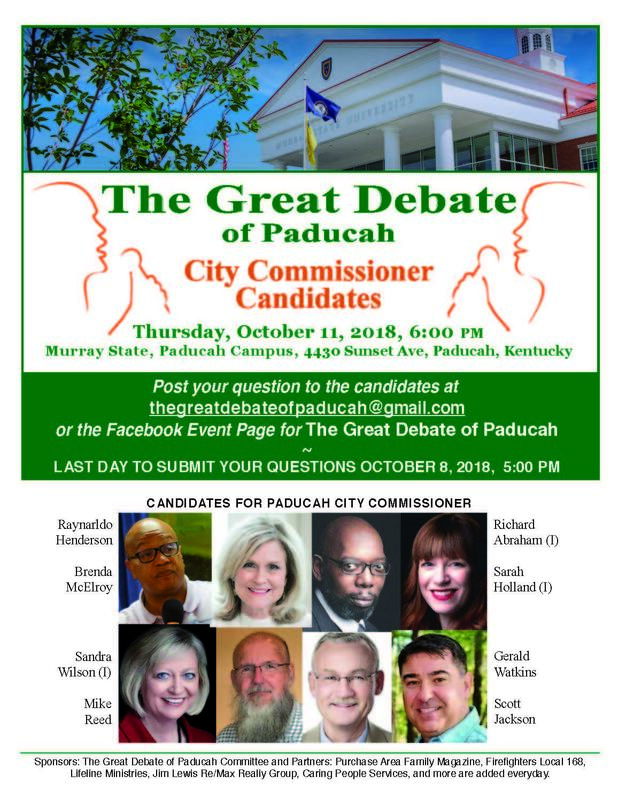 Candidates for Paducah City Commission debate Thursday evening, October 11, at the Murray State Paducah campus. ‘The Great Debate of Paducah’ is at 6 p.m. There are eight candidates on the ballot. Three incumbents running for re-election are Sandra Wilson, Richard Abraham and Sarah Stewart Holland. The other candidates are Raynarldo Henderson, Brenda McElroy, Mike Reed, Scott Jackson and outgoing District Three State Representative Gerald Watkins. Stefanie Martinez of WPSD-TV is moderating. The Paducah City Commission consists of four individuals and the mayor. The election is on November 6.